Can I go to Reading by bus ?! I live near Lyon, France. 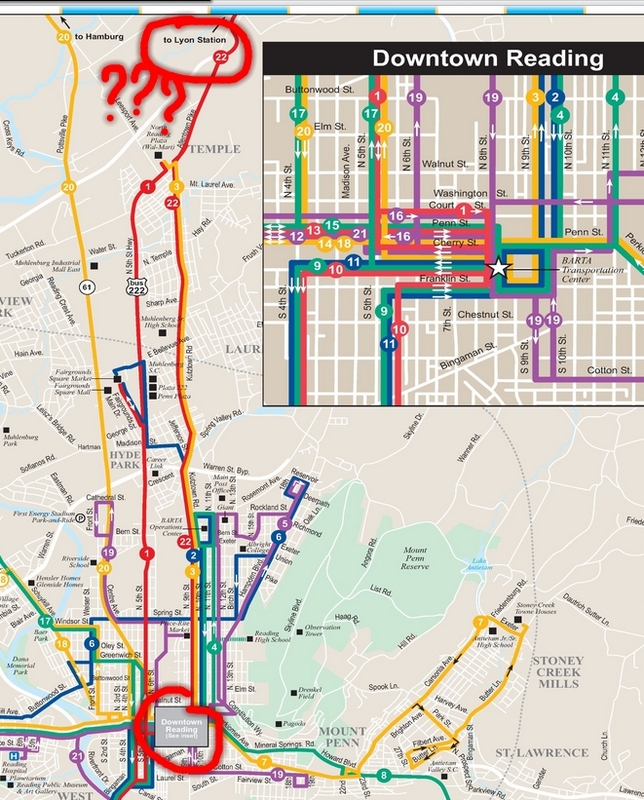 And it looks like there's a direct bus from Lyon Station to downtown Reading, PA ! It's Route 22 from Batrabus. After the worst nightmare, I had the craziest dream come true. Yesterday, after being laught at at work because of my lack of luck, I e-mailed TicketMaster to see if we can work something out for my Reading order. I asked for either a (partial) refund, a transfert to someone else's account, the ability to ship the ticket to someone in the US or for someone else to come retrieve it at the venue. The answer came later that day : the only option would be a refund of the face price and the "will call" option but only if the venue accept it. They made the request and I'll have to wait for the answer. Meanwhile, I tried to find tickets for the Atlantic City run. I made a thread on phish.net. Another thread amoung all the other "ISO AC" threads from fans left over by the TicketMaster website. I add myself in a spreadsheet gathering all the fans who need tickets. I had a private message from a nice fan who has contact me before the public sale and who might has an extra for Halloween night. My new friend from Geneva also failed on TM for Halloween but bought his 3-day pass on Stubhub. I finaly wrote an e-mail which was like a big gamble, with very low hope it might give any positive result. I'll get you access to purchase a 3 day pass for AC. No worries. I'll set that up later today. Thanks for staying with Phish over the years. Wait a minute... WHAT ?! I guess I'm the luckiest man in the world right now. Later that evening, I received another e-mail this a link to my dream. In a time span of 24 hours, I went through all the emotional phases : stress, happyness, more stress, sadness, frustration, more happyness ! 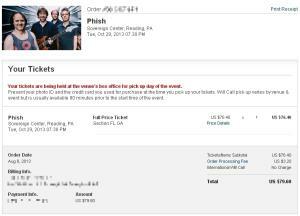 I don't know yet if my first show will be Reading or Halloween but I'll see my first Phish show in october 2013 !! I knew it wouldn't be easy. After losing the lottery, I was getting ready for the public sale this thursday. I read a lot of pieces of advice from several forums and a good link given by Holger. My TicketMaster account was ready with all the informations saved. I stayed at work later to be before a computer by 18 PM. 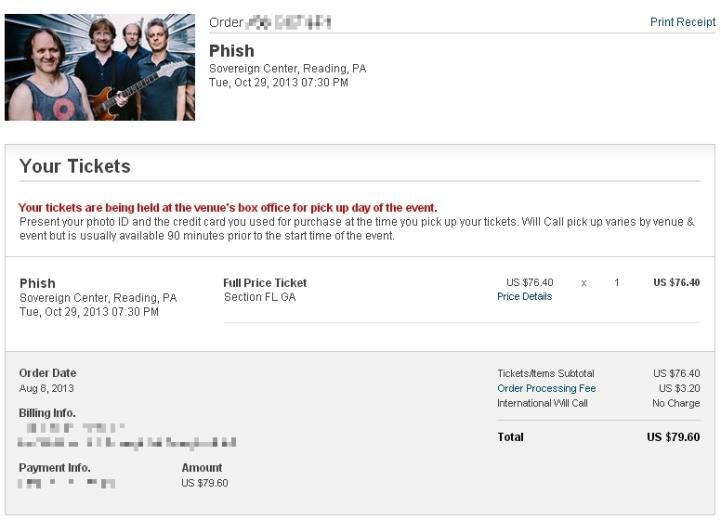 To "train" myself with the process, I logged at 17PM and tried to score a ticket for Reading, the show right before Halloween, on the 29th. Last week, I toyed with the idea of going to this show too on my way to Atlantic City but the timing wasn't right with my Morocco trip and the flights to the USA. After 10 minutes of "High demand! No match!" I'm finally offered 100 section seats, most of them behind the stage ! 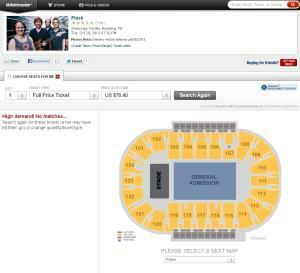 I'm still hiting the "search" button until I found General Admission floor tickets 15 minutes later. That's a good thing I tried before the Atlantic Run. I realized that I can have others tickets than the first offered. I follow the process to see what's next, if I can get to the end and so on. And so I clicked one more time... and found myself too far than I thought. I just bought my first Phish ticket. But I'll have to go myself to the venue on the day of the show with my ID and the credit card to get it ! As an international buyer, I can't have the ticket printed or shipped to France ! And then I realize that I have a non-refundable ticket to a show I can't attend and I can't sell it because I can't go to the venue to retrieve it ! And then 18 PM arrive. I click on the link for the 3-days pass, enter the quantity (just 1, I'm not greedy), select GA Floor and hit "Find Tickets". 20 minutes later, the "countdown" has already showed me "Please wait 15 minutes", "14 minutes", back to "15 minutes", "7", "4", "15", "3"... That's rather random if you ask me ! A few minutes later, the Twitter account announced that the run was SOLD OUT. How bittersweet. I paid a ticket that I won't ever see and didn't get the ones I wanted. My options now are trying to get the AC tickets from extras. But let's see on Stubhub, the prices are insane. I might find a fellow fan on phish.net but I'm not the only one who wants tickets. I can do like this japanese fan who'll fly to the show and plan on finding tickets at the venue. I can't take that risk. 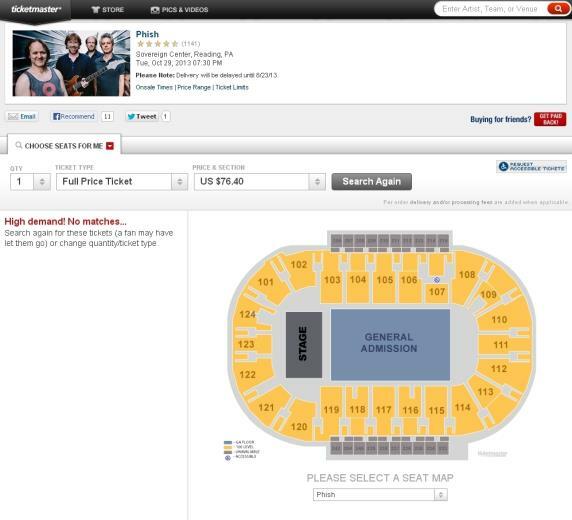 I can go to the Reading show only but that would be far too expensive for only one show. I guess I fail at Phish. After spending all of yesterday checking my bank account every 10 minutes, I finally got the bad news with an email this morning : I didn't won the lottery. So I don't have tickets yet. My next move will be the public sale on thursday 12AM EST at TicketMaster. That's 18PM in France, a time when i'm usualy at the station, waiting for my train after my day job... I'll have to stay late at work or come back home very early.